Fortuna Entertainment Group is the largest Central European betting operator. It is headquartered in Netherlands and allows users to bet on their favorite sport teams. The were able to grow new user acquisition with our help by for the Ice Hockey World Championship and the European Football Championship. "How do you predict the unpredictable?” – asks every bettor out there. What if, as an advertiser, you could make sure that your ads display information relevant to current events even if you are away from the office. Approaching Ice Hockey World Championship and the European Football Championship, Fortuna went all in allocating the majority of their online promotion budget to Facebook campaigns. 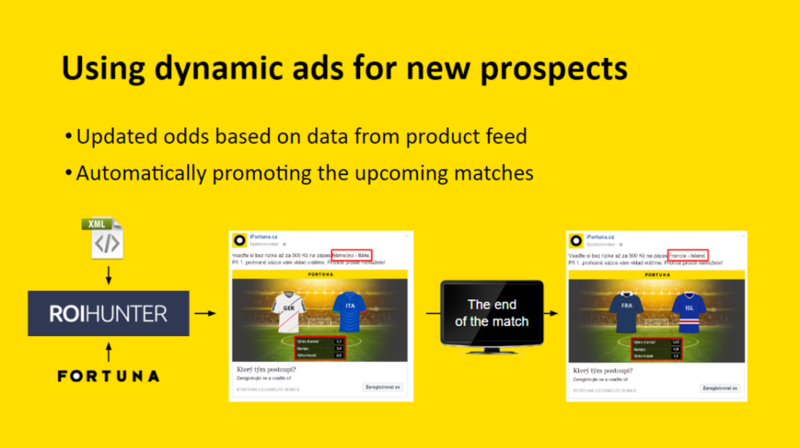 they bet on a combination of traditional advertising amplified by an unconventional use of dynamic ads carefully targeted at new user acquisition. The first step was to create a custom product XML feed. Specific games that took place during the European Championship were defined as products, with data on particular matches, team names and current rates converted from an internal system. All that was left to do for Fortuna is link the feed to the product catalog via ROI Hunter. Products were then regularly updated depending on the changing odds throughout the championship. As a result the campaign had up to 50% greater engagement and 1/3 higher click-through rates than campaigns that have been running for more than a day after the match. This strategy took the idea of dynamic advertising a step further, employing it for successful acquisition of brand new users that have not visited the website in the last 180 days. Instagram brought 9% more registrations.